We’d love your help. Let us know what’s wrong with this preview of Little Voice by Amanda Bernardo. To ask other readers questions about Little Voice, please sign up. This is a wonderful book for any child, but also for parents too. We follow 6 children as they encounter hurdles, obstacles, disappointment, sadness. We listen as their LittleVoice inside them encourages, inspires, cheers, comforts and rewards them to try harder, continue on, be themselves, think clearly, achieve goals, be brave and so much more. There are so many great lessons for your child to become familiar with. First and foremost to look within themselves for strength and happiness, and to This is a wonderful book for any child, but also for parents too. We follow 6 children as they encounter hurdles, obstacles, disappointment, sadness. We listen as their LittleVoice inside them encourages, inspires, cheers, comforts and rewards them to try harder, continue on, be themselves, think clearly, achieve goals, be brave and so much more. There are so many great lessons for your child to become familiar with. First and foremost to look within themselves for strength and happiness, and to learn to love themselves for who they are, but to always set goals, strive for their best, think positively be uniquely you! As a parent reading this book, I can absolutely relate and use this as encourage my for me – to not give up when I run my first half marathon this fall, to study hard as I work towards my phd, believe in myself as s scientist, and to always be a good, positive role model for my daughter by showing her how to love and learn, take care of myself and others, take the path less traveled and reach for the stars to make my dreams come true. This book made me teary in some parts as I thought about my own life, and hopes of my daughter being happy & successful as s child in school & her adult life, and I believe that emotion from a reader is the sign of a great book. I love Little Voice and you will too. This book is great for all ages! The message and meaning in this book is positive and enlightening. It reminded me to do what I love, to be creative, to keep going no matter what comes in my way. To listen to my inner voice that sometimes gets lost with everyday stress. I love how the illustrations and words show so much emotion and expression. I really love how the images show how struggle can be overcome and to never give up. The "Little Voice" is a book that expresses how our inner voice shou This book is great for all ages! The message and meaning in this book is positive and enlightening. It reminded me to do what I love, to be creative, to keep going no matter what comes in my way. To listen to my inner voice that sometimes gets lost with everyday stress. I love how the illustrations and words show so much emotion and expression. I really love how the images show how struggle can be overcome and to never give up. The "Little Voice" is a book that expresses how our inner voice should not be ignored. This book is a gem! There are so many messages in this book that are positive and enlightening. It is inspirational and motivational. The book is a friendly companion that belongs on every child's book shelf. This story teaches our children to be creative, to keep striving and to persevere! This book will be a part of our night time reading tradition for sure! I would love to see this book in every classroom across Canada and the world! Thank you to Amanda for giving me this wonderful opportunity. I'm so happy that I have this positive and beautiful ebook in my home and that I am able to share it with my daughters. 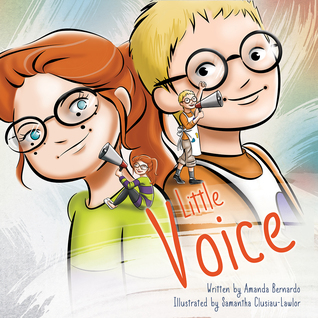 Amanda Bernardo is the author and founder behind Little Voice Books. Based out of Ottawa, Ontario, Canada, Little Voice Books is a social enterprise that seeks to educate children, and adults alike, by creating awareness for causes and initiatives through the power of literature and illustration. 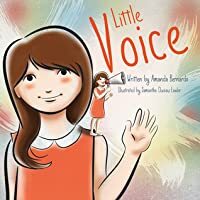 Little Voice Books aims to inspire its readers to use their voice to chase their dreams and change the Amanda Bernardo is the author and founder behind Little Voice Books. Based out of Ottawa, Ontario, Canada, Little Voice Books is a social enterprise that seeks to educate children, and adults alike, by creating awareness for causes and initiatives through the power of literature and illustration. Little Voice Books aims to inspire its readers to use their voice to chase their dreams and change the world. Proceeds from the Little Voice children’s books are used to support programs and charities throughout Canada, including the Alzheimer Society of Canada and the National Canadian Mental Health Association.